Beautiful woman sitting on the floor. A young and pretty woman in jeans and black top and hair sitting on the floor, resting, isolated for white background. 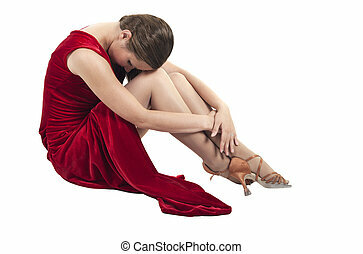 A beautiful woman in a beige dress sitting on the floor with her long curly brunette hair, looking away, isolated for white background. A gorgeous young woman in a long skirt sitting on the floor with her legs crossed, smiling, isolated for white background. 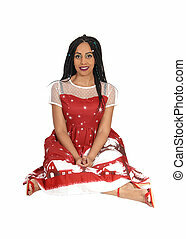 A young pretty woman sitting on the floor in a studio and having fun taking pictures from the front for white background. A gorgeous young woman in a long skirt sitting on the floor with her legs spreat, smiling, isolated for white background. A pretty woman in a black bodysuit with great design, wearing a tie and boots, sitting on the floor isolated for white background. An black haired young woman sitting on the floor with in a white dress and turning her head fast, her hair is flying. A beautiful young Hispanic woman in a knitted dress and brown boots sitting on floor, the face in her hands, isolated on white background. 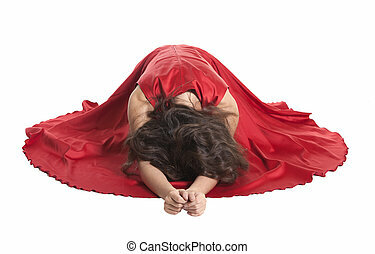 An black haired young woman lying on the floor with in a pink dress and white twill over her body. A happy woman in a black dress and long brunette hair sitting on the floor, isolated for white background. A young woman in jeans shorts and wearing a straw hat sitting on the floor, isolated for white background.